The meaning of meen is “fish” and pollichattu is “roasted or grilled”. A delicacy popular across Kerala, traditionally prepared with fresh karimeen (pearl spot fish) that is abundantly available in the state’s backwaters. After cleaning, the fish is marinated with spices and first, slightly fried in coconut oil to achieve an outer crisp exterior. 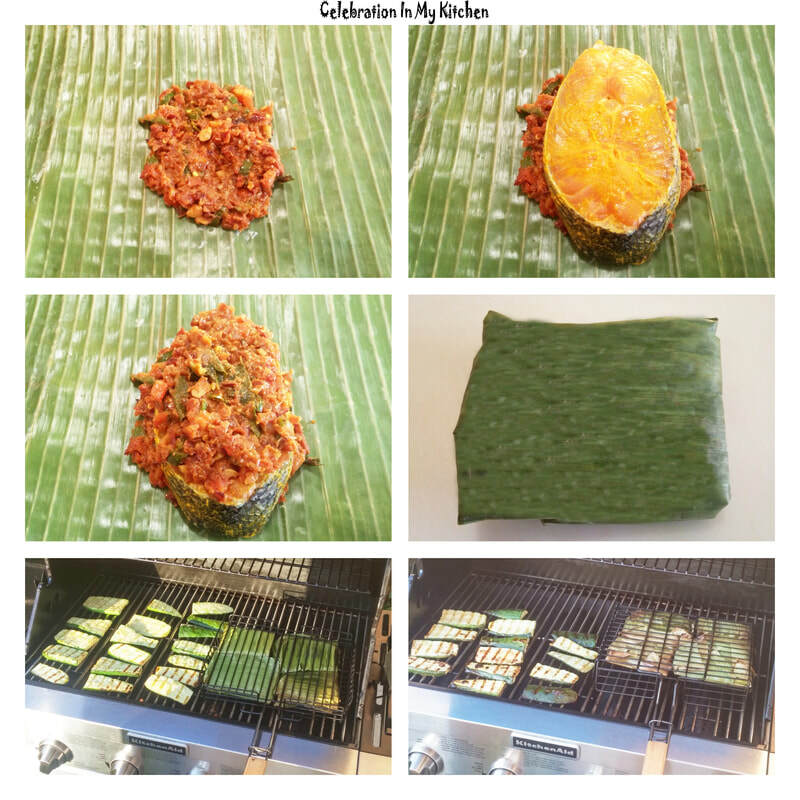 Then, encased in banana leaf, sandwiched between a spicy mixture and roasted in a skillet. 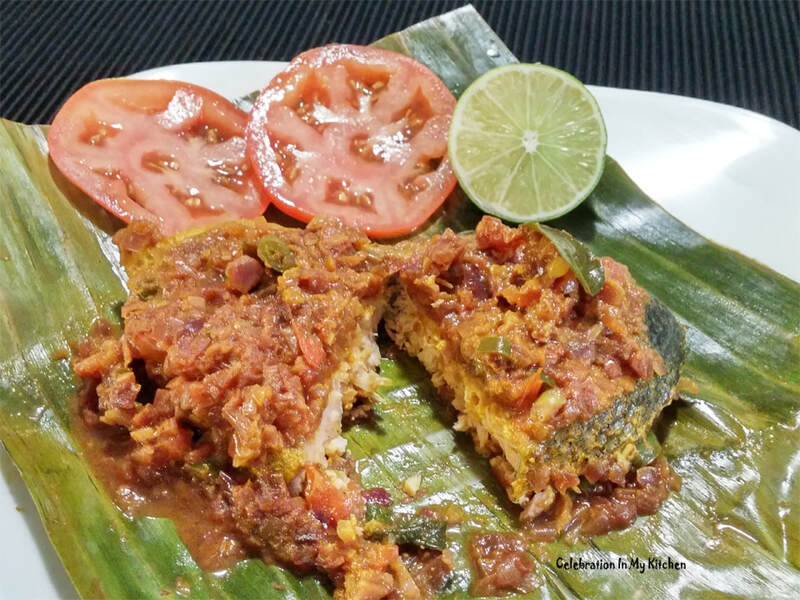 Delicious, the aroma from the banana leaf infuses and flavours the fish. Eaten with rice, loved and enjoyed by all. When karimeen (pearl spot fish, also called green chromide) is used, the dish is called karimeen pollichattu. This fish can be substituted with any firm-fleshed fish. With salmon steaks on hand, I have skipped the initial step of frying to prevent them from overcooking. 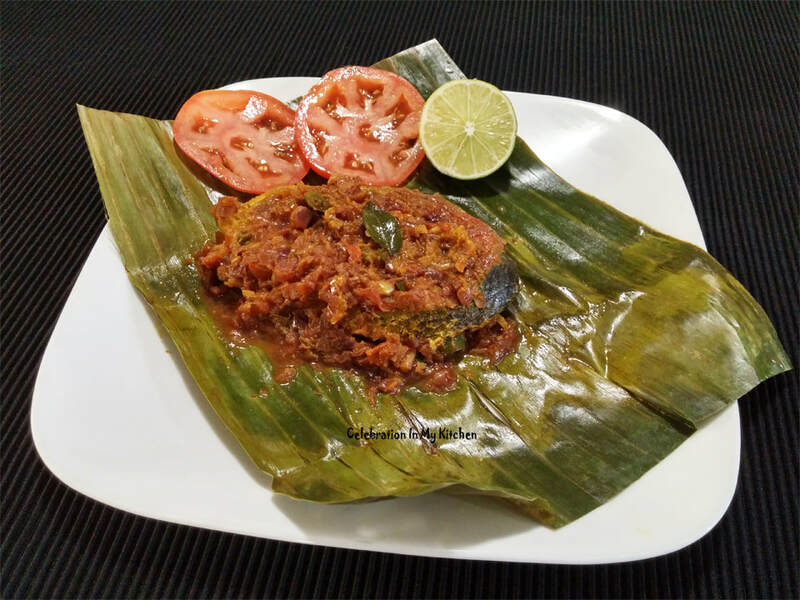 The fish parcels in banana leaf were placed in a grilling basket and then, cooked on a barbecue. 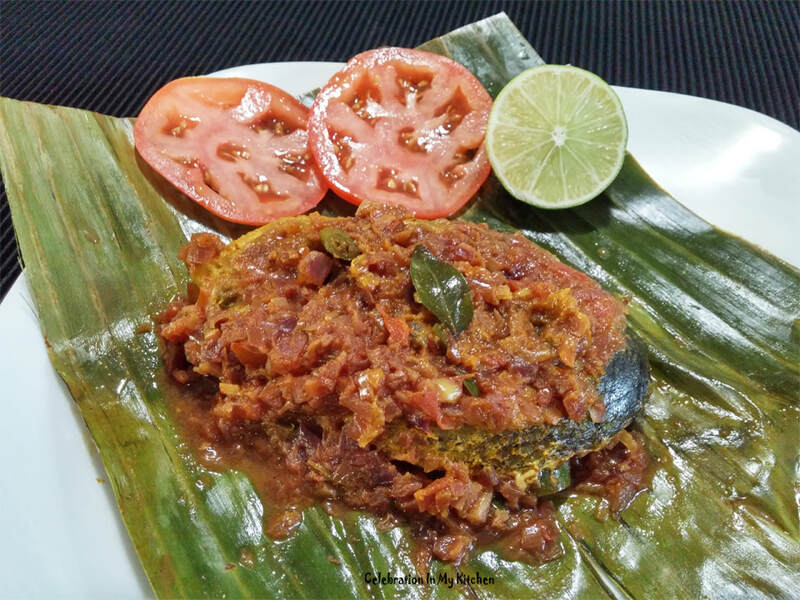 Fragrance from the banana leaf, the spicy mixture cooked in coconut oil along with the combination of the moist fish makes this dish truly unique and irresistible. In Canada, we have to use frozen banana leaves. Partially thaw the leaves till you can open them. Separate and keep aside the required number of leaves. Refold and refreeze the balance leaves. 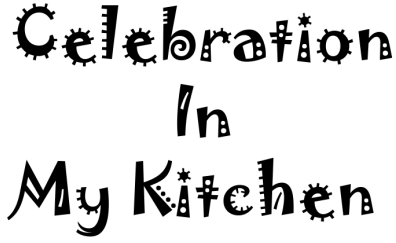 With a kitchen shear, cut and discard the thick dark brown edges. They stain the food and leave a slightly off flavour. Use a ruler to cut the leaves into required sizes. Rinse and pat dry with paper towel to remove any white residue. Wipe in the same direction as the lines on the leaf to avoid any tear. To make them pliable, just run them over an open flame moving them constantly until they soften and turn shiny. Do not burn. Alternatively, you could soften them in a bowl of boiling water. When enclosing the fish, ensure that the shiny side of the leaf is on the outside. Wash fish steaks and season with salt. Marinate with 1/2 teaspoon turmeric powder and lime juice for 30 minutes while you prepare the spice mixture. Heat oil in a skillet, saute the onion, green chillies, curry leaves, garlic and ginger. When onion is soft, add the tomato, the balance 1/2 teaspoon turmeric powder and rest of the spices. Cook on low heat until tomato is pulpy and spices well cooked. Mix in the tamarind pulp and salt. Set aside to cool. Take a piece of banana leaf and spread a spoonful of the spice mixture in the centre of the leaf. Place a salmon steak on top and cover it with another spoonful of the mixture (see picture above). Fold leaf on all sides. Turn with seam side down. Make parcels with remaining leaves and steaks. Transfer in a fish basket and grill on low heat till the leaves are charred and fish cooked, moist, not dry, around 20 minutes. Alternatively, the fish can be baked in an oven at 400 F or 200 C or roasted in a skillet over the stovetop. 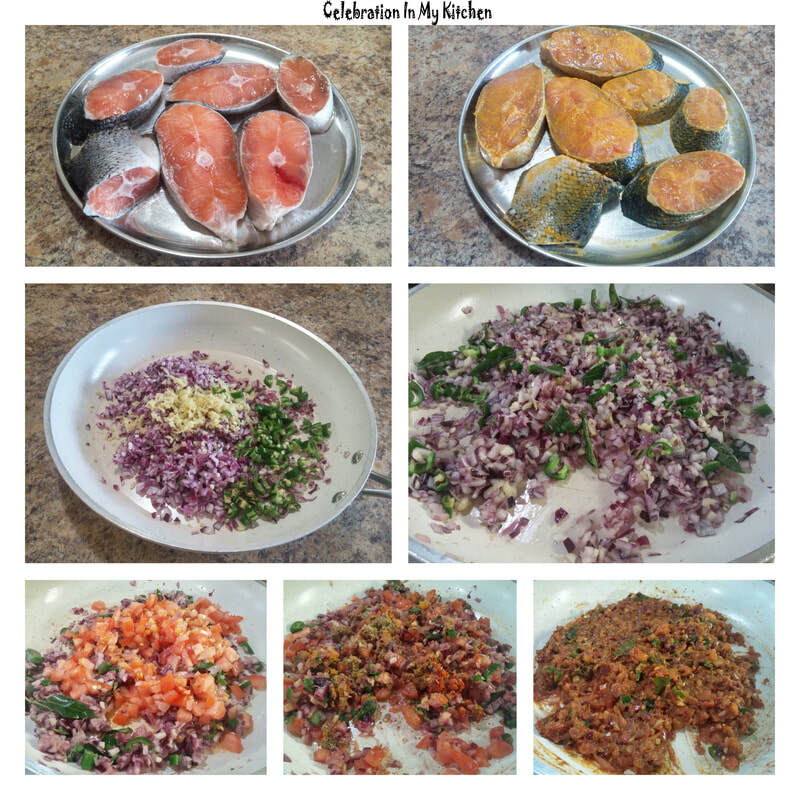 Serve the fish parcels warm with rice, dal, vegetable dish or salad.